See the cute little air bubbles? 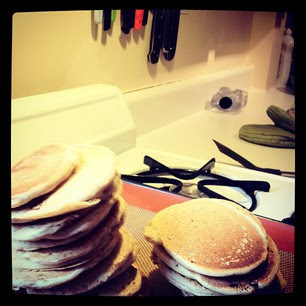 It's Shrove Tuesday! 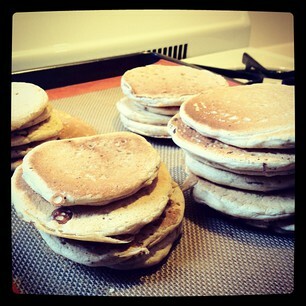 Uhhh... AKA Pancake Day! So I obviously whipped some up for breakfast just now! 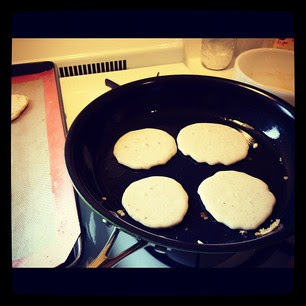 I've already posted a pancake recipe on GBOGH, but that was wayyyy back in November! You can see it by clicking here. But I felt like doing something different this morning and I figured that one can never have too many pancake recipes on the go! Here's my Pancake Recipe #2. Add the soymilk, sunflower oil and orange oil directly to the dry mix and whisk until it just comes together. The batter should we very loose and runny. It should be pourable. Allow the batter to rest for a few minutes. Warm your oven to about 200 degrees and prepare a baking sheet and wire rack to keep the pancakes warm until you are ready to dig in! Heat an oiled frying pan over medium flame. Test the heat of the frying pan my dropping a tiny dollop of batter into the frying pan. If it sizzles and bubbles up, it is ready to go! To the hot frying pan, drop 4- 2 Tbsp worth of batter into the frying pan. 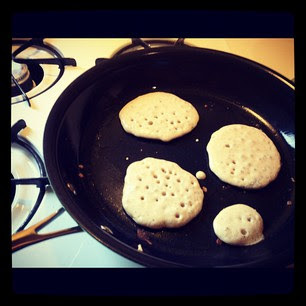 Wait for little air bubbles to appear on the surface and flip the pancakes. Cook for another minute or so. Optional add-ins : grated apple, banana slices, frozen berries, chocolate chips, almond extract and almond slivers, pineapple coconut, hazelnut chocolate, etc.